CLICK HERE FOR A FULL LIST OF U.S. FRIENDLY POKER APPS. Play anywhere on your iPhone, Android, Windows Phone or Android. 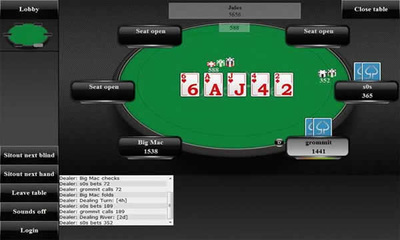 Play on up to 4 tables simultaneously. Hold'em cash games or play money. Low traffic poker room with basic functionality. Switch Poker was launched in October 2010 and has been wowing mobile poker players ever since. It's one of the few mobile-only poker sites available via the web and as a result, has been one of the most popular, as Switch Poker has dedicated as much of its time as possible to providing an excellent poker playing experience for bitcoin mobile poker fans. The site is responsible for some great innovations, such as allowing multi-tabling on tablets, having a decent range of languages, and for being the first online poker room to accept bitcoin as a currency. Read on to find out how you can get this exceptional poker room onto your mobile device. Note, Switch Poker is not available to US-based players. Despite being mobile-only, Switch Poker does have a desktop site, which you can reach here. You will need to register an account via this page in order to start playing on the Switch Poker mobile site. All you need to go is click on the link marked 'Register'. This will take you through to the registration page, where you fill in your account details and your personal details. Once you have done this, all you need to do is hit the green 'Register' button and you are all set! 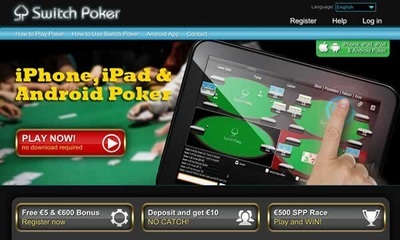 iOS Devices: Switch Poker does not offer a native Texas Hold'em app for iOS devices. Instead, if you have an iOS-based device, you need to visit the Switch Poker site on your device using Safari. You can play poker via the app that's available in your browser. Switch Poker is guaranteed to work on iPhones with 3G or higher, or iPads. The iPad version of the app has limited sounds. Android Devices: There are two ways of playing at Switch Poker on your Android-powered smart-phone or tablet. You can visit the Switch Poker site on your device and play via the browser, or you can download a native app to your mobile device. Both options should work as long as you are running Android 1.6 or higher. The best browser to use the browser-only version of the site is probably Chrome, but you use Firefox or Opera as well. You can download and install the dedicated app by visiting the Switch Poker site on your device and selecting the 'Android App'. This will take you to the downloading of an apk (Android package) file that you can download and install to your device in the normal way. Windows Phone Devices: Switch Poker software is designed to be played from any browser so users of Nokia Lumia or Microsoft phones and tablets should have no problem playing from the I.E. browser of their device. 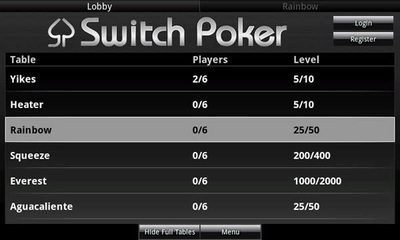 Currently, when you enter the Switch Poker lobby, you can choose between 6max and heads-up tables, and you can play at up to four tables simultaneously (only suitable for tablets as the screen becomes too tiny with smart-phones). You can also play for play money. The tables are very non-fussy – a green oval with every player's name in a black box at their position. 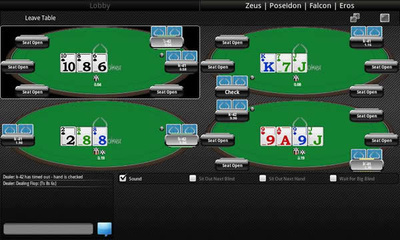 There are no avatars or other such features designed to appeal to casual players, meaning Switch Poker is likely to be received well by more serious poker fiends. The game controls are very easy to use – three buttons marked 'Fold' or 'Check/Fold' if checking is available, 'Call' and 'Raise'. The call and raise button come pre-filled with default amounts, but you can easily change these using a slider that sits about the three buttons. You have twenty seconds each turn to complete your action, else your hand is folded. Switch Poker automatically uses a four-colour deck – diamonds are blue and clubs are green – which may put some people off. The poker room's sole nod to casual poker is the medals that can be earned by playing poker. These are gold, silver and bronze models, and are awarded for various poker-related achievements. Your medals are displayed next to your name when you play, if you choose to display them. Switch Poker offers you not one, not two, but three tasty bonuses to get you going with their app. The first is €5 absolutely free! All you need to do to obtain this bonus is to verify your phone number with the site. Once you have done this, €5 will miraculously appear in your cashier account. The second bonus is a micro deposit bonus, which is available for deposits of between €0.50 and €5. This is only available to first-time depositors, and you need to enter the bonus code 'FREE5' when you make your deposit, which will then be matched 100 percent. There are no other requirements. The first bonus is another 100 percent matched deposit bonus, but this time it's for bonuses between €20 and €600. 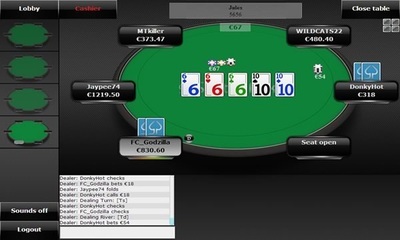 You need to make a deposit of between €20 and €600 using the bonus code '20TO600', which Switch Poker will then match. To release this bonus, you need to earn 2,500 SPPs (Switch Poker Points) within six months of joining. You earn SPPs by playing in real money games, and you earn 100 SPPs for every Euro in rake you generate. You cannot exchange SPPs for cash, but you can use them in the various promotions that Switch Poker runs. Switch Poker has a minimum withdrawal limit of €50, and may request documentation for large withdrawals. You can use both Visa and MasterCard to fund your account, although you cannot withdraw to a MasterCard account. You can also use Skrill, Moneta.ru (popular with Eastern European players), Ukash and the afore-mentioned Bitcoin for your poker funding needs. It has to be said that although Switch Poker has now been around for a while, it still needs a lot of work to bring it up to the standards offered by other mobile poker rooms. Traffic is a little light, but those who do use this room are full of praise for it. If Switch Poker does make the additions that it has promised, it will be well on the way to holding it's own as one of the best mobile poker rooms available.